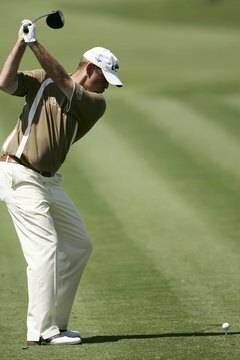 Thomas Bjorn has coiled his body and is ready to strike at the 2007 CA Championship. When golf instructors talk about coiling in the backswing, they’re discussing “the turning of the body away from the target,” says PGA pro Mark Blakemore. All else being equal, the more you coil your body during the backswing, the more swing speed you’ll generate in the downswing -- but only if you coil properly. Coiling your body improperly will rob you of power. Golf instructors recommend a variety of methods to help players coil correctly. All-time golf great Jack Nicklaus believes a player’s knee action is important to a proper backswing. As you take the club back the front knee should move forward and to the right (for a right-handed player) to allow your hips to rotate properly. At the same time, the back knee should remain stiff to brace the right leg and prevent your body from sliding to the right. When your back leg remains firm during the backswing, “the body is coiling like a spring around the knee,” Nicklaus says. A reverse pivot occurs on the backswing when your lower body slides away from the target, which will cause you to lose power. Golf teacher Peter Krause says a simple drill may help teach golfers to use the upper body to shift their weight during the backswing. Stand in front of a mirror while holding a club horizontally against your upper chest with your arms crossed. Turn your upper body as you would in your backswing. The club should remain fairly level. If the end of the club on the left side of your chest dips it means you’re sliding your hips left and not coiling properly. Long drive champion Jason Zuback recommends driving a shaft or long pole into the ground just outside the ball of your right foot. Be sure that your right thigh remains inside the shaft as you take some practice swings. PGA pro Tom Denby says your left knee, right hip and left shoulder (for a right-hander) must move in concert as you coil in the backswing. The left knee moves toward the ball, forcing the right hip to rotate back, which then allows the left shoulder to swing around and point down toward the ball. Tiger Woods says if you slide your right hip outside of your right foot “you’ve cut your power by about 50 percent.” Woods focuses on keeping his weight over the inside of his right foot during his backswing while keeping the angle of his right leg steady.